I wrote a post on quantum-mechanical operators some while ago but, when re-reading it now, I am not very happy about it, because it tries to cover too much ground in one go. In essence, I regret my attempt to constantly switch between the matrix representation of quantum physics – with the | state 〉 symbols – and the wavefunction approach, so as to show how the operators work for both cases. But then that’s how Feynman approaches this. Most practical examples of quantum-mechanical systems (like the description of the electron orbitals of an atomic system) involve continuous coordinate spaces, so we have an infinite number of states and, hence, we need to describe it using the wavefunction approach. Most of us are much better-versed in using derivatives and integrals, as opposed to matrix operations. So let’s stick to the wavefunction approach here. So, while you need to remember that there’s a ‘matrix equivalent’ for each of the equations we’re going to use in this post, we’re not going to talk about it. In classical physics – high school physics, really – we would describe a pointlike particle traveling in space by a function relating its position (x) to time (t): x = x(t). Its (instantaneous) velocity is, obviously, v(t) = dx/dt. Simple. Obvious. Let’s complicate matters now by saying that the idea of a velocity operator would sort of generalize the v(t) = dx/dt velocity equation by making abstraction of the specifics of the x = x(t) function. The principle is illustrated below. Simple? Yes and no. The r·|ψ(r)|2 integrand is obvious: we multiply each possible position (r) by its probability (or likelihood), which is equal to P(r) = |ψ(r)|2. However, look at the assumptions: we already omitted the time variable. Hence, the particle we’re describing here must be stationary, indeed! So we’ll need to re-visit the whole subject allowing for averages to change with time. We’ll do that later. I just wanted to show you that those integrals – even with very simple operators, like the position operator – can become very complicated. So you just need to make sure you know what you’re looking at. One wavefunction—or two? Or more? There is another reason why, with the immeasurable benefit of hindsight, I now feel that my earlier post is confusing: I kept switching between the position and the momentum wavefunction, which gives the impression we have different wavefunctions describing different aspects of the same thing. That’s just not true. The position and momentum wavefunction describe essentially the same thing: we can go from one to the other, and back again, by a simple mathematical manipulation. So I should have stuck to descriptions in terms of ψ(x, t), instead of switching back and forth between the ψ(x, t) and φ(x, t) representations. The energy of any oscillator is given by the E = m·ω02/2. We may want to liken the real and imaginary component of our wavefunction to two oscillators and, hence, add them up. The E = m·ω02 formula we get is then identical to the E = m·c2 formula. The energy of a spinning mass is given by an equivalent formula: E = I·ω2/2 (I is the moment of inertia in this formula). The same 1/2 factor tells us our particle is, somehow, spinning in two dimensions at the same time (i.e. a ‘real’ as well as an ‘imaginary’ space—but both are equally real, because amplitudes interfere), so we get the E = I·ω2 formula. Hence, the formulas tell us we should imagine an electron – or an electron orbital – as a very complicated two-dimensional standing wave. 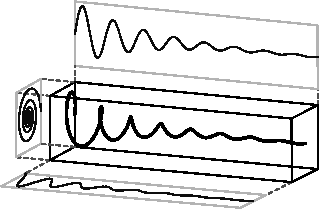 Now, when I write two-dimensional, I refer to the real and imaginary component of our wavefunction, as illustrated below. What I am asking you, however, is to not only imagine these two components oscillating up and down, but also spinning about. Hence, if we think about energy as some oscillating mass – which is what the E = m·c2 formula tells us to do, we should remind ourselves we’re talking very complicated motions here: mass oscillates, swirls and spins, and it does so both in real as well as in imaginary space. In that post of mine, I showed how the position, momentum and energy operator would give us the average position, momentum and energy of whatever it was that we were looking at, but I didn’t introduce the angular momentum operator. So let me do that now. However, I’ll first recapitulate what we’ve learnt so far in regard to operators. The * symbol tells us to take the complex conjugate of the wavefunction. As for the integral, it’s an integral over some volume, so that’s what the d3r shows. Many authors use double or triple integral signs (∫∫ or ∫∫∫) to show it’s a surface or a volume integral, but that makes things look very complicated, and so I don’t that. I could also have written the integral as ∫ψ(r)*·H·ψ(r) dV, but then I’d need to explain that the dV stands for dVolume, not for any (differental) potential energy (V). We must normalize our wavefunction for these formulas to work, so all probabilities over the volume add up to 1. Note how the operator, for the one- as well as for the three-dimensional case, gets rid of time as a variable. In fact, the idea itself of an average makes abstraction of the temporal aspect. Well… Here, at least—because we’re looking at some box in space, rather than some box in spacetime. We’ll re-visit that rather particular idea of an average, and allow for averages that change with time, in a short while. Now it’s time to define the operator we wanted to talk about, i.e. the angular momentum operator. Now, spin is a complicated phenomenon, and so, to simplify the analysis, we should think of orbital angular momentum only. This is a simplification, because electron spin is some complicated mix of intrinsic and orbital angular momentum. Hence, the angular momentum operator we’re introducing here is only the orbital angular momentum operator. However, let us not get bogged down in all of the nitty-gritty and, hence, let’s just go along with it for the time being. I am somewhat hesitant to show you how we get that formula for our operator, but I’ll try to show you using an intuitive approach, which uses only bits and pieces of Feynman’s more detailed derivation. It will, hopefully, give you a bit of an idea of how these differential operators work. Think about a rotation of our reference frame over an infinitesimally small angle – which we’ll denote as ε – as illustrated below. Now, because ε is an infinitesimally small angle, we may equate cos(θ) = cos(ε) to 1, and cos(θ) = sin(ε) to ε. Hence, x’ and y’ are then written as x’ = x + εy and y’ = y − εx, while z‘ remains z. Vice versa, we can also write the old coordinates in terms of the new ones: x = x’ − εy, y = y’ + εx, and z = z‘. That’s obvious. Now comes the difficult thing: you need to think about the two-dimensional equivalent of the simple illustration below. 1. We will want to re-write the infinitesimally small ε angle as a fraction of i, i.e. the imaginary unit. Huh? Yes. This little i represents many things. In this particular case, we want to look at it as a right angle. In fact, you know multiplication with i amounts to a rotation by 90 degrees. So we should replace ε by ε·i. It’s like measuring ε in natural units. However, we’re not done. 2. We should also note that Nature measures angles clockwise, rather than counter-clockwise, as evidenced by the fact that the argument of our wavefunction rotates clockwise as time goes by. So our ε is, in fact, a −ε. We will just bring the minus sign inside of the brackets to solve this issue. 3. The third modification we’d want to make is to express ε·i as a multiple of Planck’s constant. Huh? Yes. This is a very weird thing, but it should make sense—intuitively: we’re talking angular momentum here, and its dimension is the same as that of physical action: N·m·s. Therefore, Planck’s quantum of action (ħ = h/2π ≈ 1×10−34 J·s ≈ 6.6×10−16 eV·s) naturally appears as… Well… A natural unit, or a scaling factor, I should say. The final substitution, which yields the formula we just gave you when commencing this section, just uses the formula for the linear momentum operator in the x– and y-direction respectively. We’re done! 🙂 Finally! Well… No. 🙂 The question, of course, is the same as always: what does it all mean, really? That’s always a great question. 🙂 Unfortunately, the answer is rather boring: we can calculate the average angular momentum in the z-direction, using a similar integral as the one we used to get the average energy, or the average linear momentum in some direction. That’s basically it. 1. We should not put any dot (·) between our operators, because they do not amount to multiplying one with another. We just apply operators successively. Hence, commutativity is not what we should expect. OK. So what do we conclude? What are we talking about? What’s the interpretation for the position operator, and the energy operator? Here we are not so sure. The integrals above make sense, but these integrals are used to calculate averages values, as opposed to instantaneous values. So… Well… There is not all that much I can say about the position and energy operator right now, except… Well… We now need to explore the question of how averages could possibly change over time. Let’s do that now. I know: you are totally quantum-mechanicked out by now. So am I. But we’re almost there. In fact, this is Feynman’s last Lecture on quantum mechanics and, hence, I think I should let the Master speak here. So just click on the link and read for yourself. It’s a really interesting chapter, as he shows us the equivalent of Newton’s Law in quantum mechanics, as well as the quantum-mechanical equivalent of other standard equations in classical mechanics. However, I need to warn you: Feynman keeps testing the limits of our intellectual absorption capacity by switching back and forth between matrix and wave mechanics. Interesting, but not easy. For example, you’ll need to remind yourself of the fact that the Hamiltonian matrix is equal to its own complex conjugate (or – because it’s a matrix – its own conjugate transpose. This is the quantum-mechanical equivalent of Newton’s force law: F = m·a. Huh? Yes. Think of it: the spatial derivative of the (potential) energy is the force. Now just think of the classical dp/dt = d(m·v) = m·dv/dt = m·a formula. […] Can you see it now? Isn’t this just Great Fun? Note, however, that these formulas also show the limits of our analysis so far, because they treat m as some constant. Hence, we’ll need to relativistically correct them. But that’s complicated, and so we’ll postpone that to another day. Post scriptum 1: I just love Feynman but, frankly, I think he’s sometimes somewhat sloppy with terminology. In regard to what these operators really mean, we should make use of better terminology: an average is something else than an expected value. Our momentum operator, for example, as such returns an expected value – not an average momentum. We need to deepen the analysis here somewhat, but I’ll also leave that for later. This is interesting in light of our interpretation of the Schrödinger equation as an energy propagation mechanism. If we write Schrödinger’s equation like we write it here, then we have the energy on the right-hand side – which is time-independent. How do we interpret the left-hand side now? Well… It’s kinda simple, but we just have the time rate of change of the real and imaginary part of the wavefunction here, and the i·ħ factor then becomes a sort of unit in which we measure the time rate of change. Alternatively, you may think of ‘splitting’ Planck’s constant in two: Planck’s energy, and Planck’s time unit, and then you bring the Planck energy unit to the other side, so we’d express the energy in natural units. Likewise, the time rate of change of the components of our wavefunction would also be measured in natural time units if we’d do that. I know this is all very abstract but, frankly, it’s crystal clear to me. This formula tells us that the energy of the particle that’s being described by the wavefunction is being carried by the oscillations of the wavefunction. In fact, the oscillations are the energy. You can play with the mass factor, by moving it to the left-hand side too, or by using Einstein’s mass-energy equivalence relation. The interpretation remains consistent. In fact, there is something really interesting here. You know that we usually separate out the spatial and temporal part of the wavefunction, so we write: ψ(r, t) = ψ(r)·e−i·(E/ħ)·t. In fact, it is quite common to refer to ψ(r) – rather than to ψ(r, t) – as the wavefunction, even if, personally, I find that quite confusing and misleading (see my page onSchrödinger’s equation). Now, we may want to think of what happens when we’d apply the energy operator to ψ(r) rather than to ψ(r, t). We may think that we’d get a time-independent value for the energy at that point in space, so energy is some function of position only, not of time. That’s an interesting thought, and we should explore it. For example, we then may think of energy as an average that changes with position—as opposed to the (average) position and momentum, which we like to think of as averages than change with time, as mentioned above. I will come back to this later – but perhaps in another post or so. Not now. 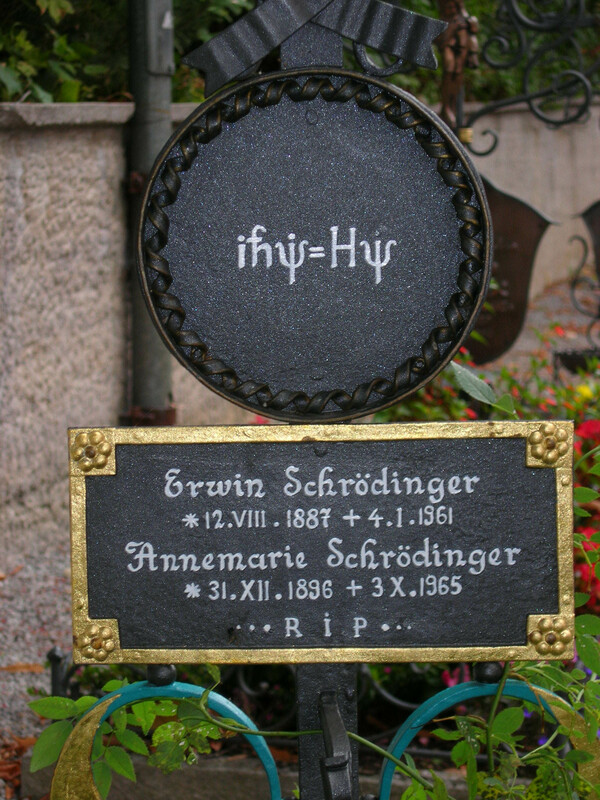 The only point I want to mention here is the following: you cannot use ψ(r) in Schrödinger’s equation. Why? Well… Schrödinger’s equation is no longer valid when substituting ψ for ψ(r), because the left-hand side is always zero, as ∂ψ(r)/∂t is zero – for any r.
It’s a basic thing, really: Schrödinger’s equation is not valid for just any function. Hence, it does not work for ψ(r). Only ψ(r, t) makes it work, because… Well… Schrödinger’s equation gave us ψ(r, t)!